We noted in a blog post a couple of weeks ago that House Memorial 65 had received wide bipartisan support in the New Mexico House of Representatives. 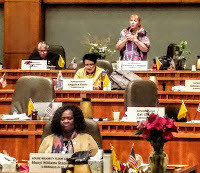 HM65, which was introduced on March 5, reaffirmed ongoing efforts to address hunger (and poverty) in New Mexico in the broadest way possible and to consider long-term solutions to this problem that has afflicted our state for so long. 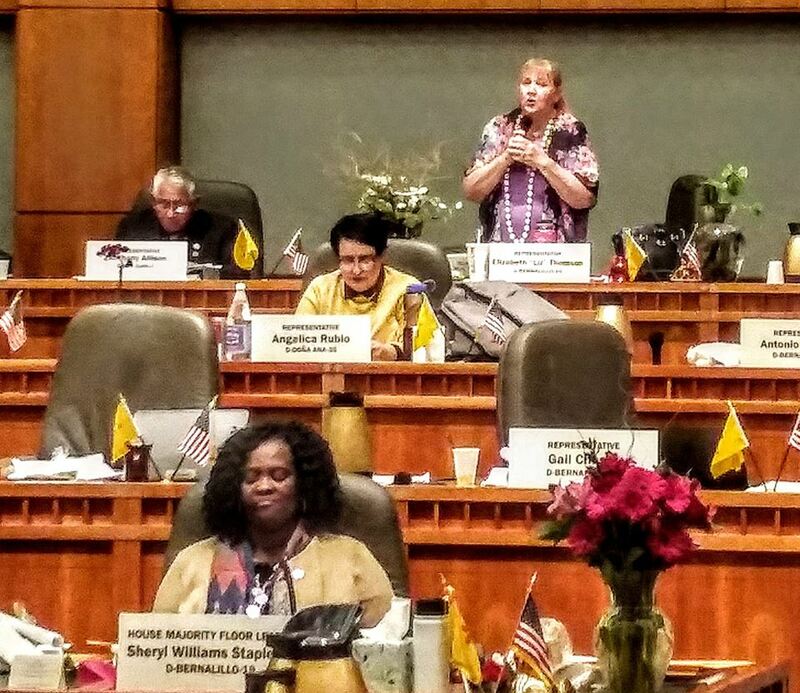 The hunger council was created during the 2018 legislative session (via House Memorial 90), and HM65 requests that he council "continue its work on a single, statewide plan for ending hunger in New Mexico." This year's memorial also requests the formation of a "hunger caucus to support legislation aimed at ending hunger in New Mexico." We have transcribed the specific comments from representatives of both parties who spoke in support HM65 on the House floor on March 5. The full House approved the memorial in a unanimous vote. You can watch the proceedings in this video posted on the State Legislature's website, The portion of the session dealing with HM65 is about 24 minutes, starting at 12:53:09 p.m. and ending with the vote at 1:17:28 p.m. Here is a lightly edited transcription. 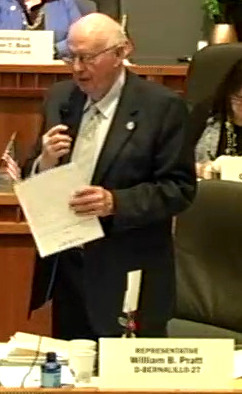 We have added links to organizations or programs that some of the legislators mentioned in their comments. At about 12:53 p.m. on March 5, the House clerk read the full text of HM65. The reading was followed by an introduction of members of the Hunger Council, who have been working on this effort for a couple of years by Rep.Joanne Ferrary and Rep. Rebecca Dow, lead sponsors of the memorial. Ellen Buelow (Interfaith Hunger Coalition), Joy Dinaro (Interfaith Hunger Coalition), Carlos Navarro (Interfaith Hunger Coalition), Brenda Sinfield (Interfaith Hunger Coalition), Allison Griffin (Collari Communications Global), Alissa Barnes (Roadrunner Food Bank), Eva Gonzales (AARP-New Mexico), Patty Keane (UNM Prevention Research Center), Mag Strittmatter (Roadrunner Food Bank) and Amber Wallin (New Mexico Voices for Children), were recognized. 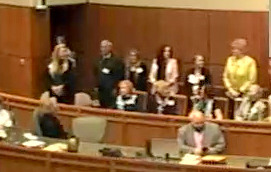 These legislators stood up to express support for HM65. I began my career in food security, working in Mozambique Africa (Project RX) moving into D.C. at the International Food Policy Research Institute. As we well know, hunger doesn't just mean not having access to food, caloric food. Communities in New Mexico often are not just food deserts, but have an inability to access nutritious food. That means you can get a bag of chips, or you can drink a soda, but that doesn't mean that you're getting the quality of food that you need to sustain, to think well, to thrive and to live a good live. I was so fortunate to grow up with my mom and my dad who cooked in the kitchen, who knew the difference between different vegetables, and we were able to have a garden and to really understand where it came from. And I think it's so important that we're connecting the dots with everyday hunger needs, not just for that which is food, but for that which is nutritious foods, and teaching not only our parents but our kids how to be able serve themselves sustainably with the food we have available. 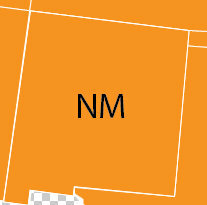 New Mexico could be and should be the breadbasket for the United States. So many of us are working on this from an agricultural perspective. This is just so exciting coming together to support this important legislation. You will find in your place an apple with an explanation of malnutrition attached to it. And also a plate that the apple is sitting on. And these plates were made for us by children. I would like to read the plate that is in my place. My plate is written in pencil, and it says, "I need a food backpack for home because we run out of food. We don't have food stamps and have about 10 people in our house." So there are many children throughout New Mexico who are in this situation. I rise in support of this memorial. I rise to remind the members that diet has a very important impact on health and health care costs. Poor diet means poor health. A better diet means better health and lower health care costs. (Note: Dr. Pratt has been a physician and orthopedic surgeon for 50 years). I want to stand up and say a special thank you to Roadrunner Food Bank. They make such an impact across the state. And if your community is like my community, when the Roadrunner Food Bank truck arrives, people are lined up around the building and fill the inside of the building to get the 20 pounds of free food. And it really does go a long way to getting fresh nutritious foods into the homes in our communities. I also want to mention our senior meal sites across the state. They are so critically important. And to thank our senior members who established those and have been advocates of those. I knew they were important before I ran for office: the companion programs, the foster grandparent programs, going and seeing the seniors working out in the fitness center, and in the computer lab, and just camaraderie and the relationships that were built from the senior meal sites. It wasn't until I was campaigning, and I was knocking and doors that I realized what it it really meant for food security for our most vulnerable seniors. A little 90-year old lady invited me into her home to show me her refrigerator and her pantry, and to tell me that that meal came from a senior meal site, and that it was a home delivery, and that person who delivered that meal to her was her friend. (Campaigning in) the next block, someone who is bedridden with no extended family would tell me how important the senior meal sites were to them and they had no other way to have food delivered to them, and the person that delivered the food was their friend. I just want to thank the many members of this body who have been advocating for our senior meal sites. I hope that we find a solution during this session to make sure that these are viable and remain available in our communities. (Note: The New Mexico Aging & Long Term Services Department offers this partial list of sites that provide home-delivered meals as well as locations where seniors can go for meals). I too rise in support of your memorial. 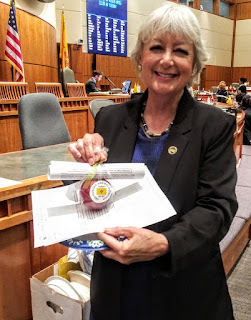 Myself and Sen. (Liz) Stefanics have carried legislation (SB84) for gardens for senior meal sites and for New Mexico grown fruits and vegetables to get into our senior meal sites. I rise in support of feeding New Mexico, from children to the elderly and everyone in between. I'm in full support of this. We have to be very cognizant that we in America, and in our state, have people that are hungry. I kind of feel like a slob at times whenever I note that I have plenty of food in my pantry, and in my freezer and in my refrigerator, and there are some that don't...I want to commend the efforts of Pastor Mark Green (Harvest Ministries) in the Roswell area. He is fantastic. I have worked with him on several projects regarding this. I get calls from my constituents all the time, saying "hey, there's a family living such and such and know that they are in dire straights right now." I know that all I have to pick up the phone and call Mark Green, and he does follow through. We have a group of women in the Dexter-Hagerman area called Loaves and Fishes that do the same thing. In our rural areas especially, it is very important that people that are aware of those that are hungry. It's also very important for me that our senior centers are also able to feed our elders. Sometimes, that may be the only meal they get that day--either tat our senior centers or through the meals on wheels project.Take a look around you, let's help those who are hungry, let's help those kids that are going to bed on an empty stomach. We need to be very cognizant of the fact that there are those in need in our state, and it makes me very sad. Even if you don't see hunger, it is all around you. People (might) say, "she's really overweight, she can't be hungry." That's not true. The cheapest foods are the most fattening foods. Because someone may be overweight doesn't mean that they are eating the right foods, that they're getting enough to eat. They're eating what is filling. 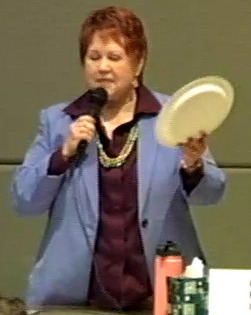 And I will tell you a quick story--our governor, when she was in DC (Congress), took the SNAP Challenge. We talked during that time. She said she had eaten more ramen during that time than she did even when she was in college. If you've been to DC, you can't buy anything for under $10. It's great that we have someone on the fourth floor who has lived with the SNAP diet and knows how really diffficult that is. I rise in support of your memorial. I will tell you that I have had probably more calls and more work to help get funding back to our community to help pay for senior meals than almost anything in my past four years. I think a lot of our citizens get their best meal of the day when they go to the senior site to get their meal. I have been through there many times, and there's literally hundreds of people there. We have one senior site in Clovis. I really appreciate you bringing this forward. Hopefully, we will be able to get the funding all straightened out for all our senior sites, and have adequate funding for meals for our seniors and for our home delivery services. I really thank you for bringing this forward. I rise to support this resolution. I think New Mexico for far too long has had hunger as part of our our social economic cultural fabric. I salute you for bringing this memorial to the front because we're all here to do good work. The work we do could not be better in this area, or more important. Thank you everyone for your comments and all of the memorial sponsors. We had mentioned the SNAP Challenge. (There is a copy) on your desk. If you'd like to take it--probably once you get home because we're all so busy not getting to eat anyway. This SNAP Challenge is something that I think makes everything become real to us. 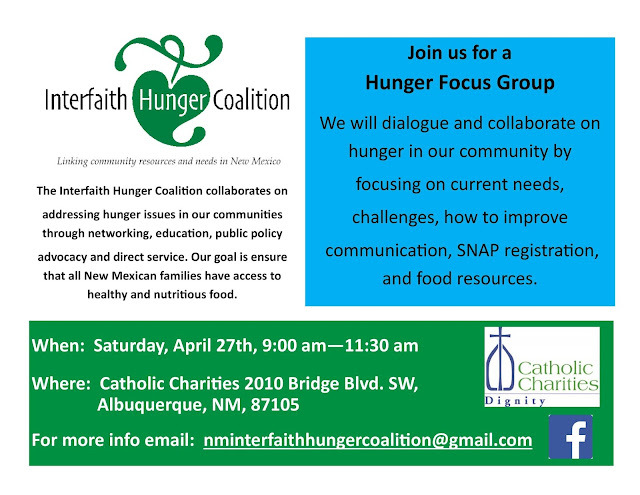 Also, there is an invitation for all of our members to join the Hunger Caucus. We didn't get to reach to everyone before we printed this, we wanted to get everyone to realize how important this is. Please join our caucus as founding members. I just wanted you to know that the Senate this morning has also cast the same memorial. Thank you to our volunteers who have put in so much of their time to support their communities, and working with distributions, with food banks and seniors, and it's just wonderful the work that you've done. I move (for approval) of House Memorial 65 And I ask for unanimous consent. We are in final passage of House Memorial 65. The vote is now closed by a vote of 70 in the affirmative and zero in the negative. House Memorial 65 has passed the house. Note: We are still in the process of compiling the names of the representatives and legislators that signed up for or committed to be part of the Legislative Hunger Caucus. We will post a list at later date. What if a food pantry in the South Valley or the Northeast Heights is running low on certain types of food like fresh fruit and vegetables? Or what if a food pantry does not have the capability of carrying certain types of food because of a lack of refrigeration? Or how do pantries cope there is an overall shortage of canned goods, as was the case this past December? Or how do pantries coordinate when there is a sudden spike in the number of clients, as was the case with the recent government shutdown? On the other side of the coin, what happens when pantries have too much of a certain type of food like milk? Food pantries come in all shapes and sizes and meet the needs of a broad clientele. The Interfaith Hunger Coalition is working to create a system to connect pantries in the Albuquerque area through an informal network. 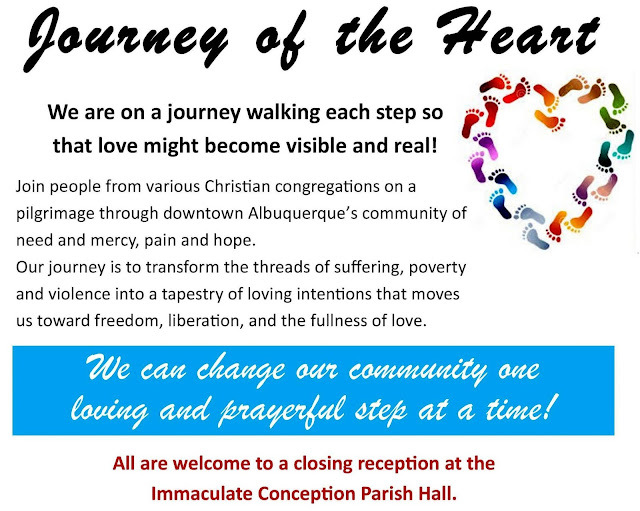 This is a project that we will discuss at a special meeting on Saturday morning, April 27, at Catholic Charities. 2010 Bridge Blvd. SW. The IHC Education Committee is meeting this week to iron out some details, so stay tuned. We will issue a special invitation in coming weeks. One of the goals of the Food Pantry project is to help pantries serve as each other's resource to refer clients when food supplies are tight or when certain types of food are required. We also want to take an inventory of the resources we currently have available in the Albuquerque area. Please join us at our bimonthly meeting on Tuesday, March 26, at First Presbyterian Church, at 12:00 Noon. Karen Navarro, Resource Directory Manager at SHARE New Mexico, who will give an update on food resources in the Albuquerque area and elsewhere in New Mexico. Jason Riggs, who will tell us about a new call center at Roadrunner Food Bank. Jason is SNAP Outreach Coordinator at the food bank. Representatives of nine congregations gathered on Saturday morning, March 16, to discuss the 2019 Offering of Letters: Better Nutrition, Better Tomorrow and to hear from one of our newest members of the Bread for the World national board of directors. About a dozen people attended the workshop, which included members of Albuquerque Mennonite Church, Annunciation Catholic Church, Immaculate Conception Catholic Church, La Mesa Presbyterian Church, Our Lady of the Most Holy Rosary Catholic Community, St. Andrew Presbyterian Church, St. John XXIII Catholic Community, St. Paul Lutheran Church and St. Timothy Lutheran Church. Most of these churches also participated in our 2018 letter-writing campaign, which yielded 1, 353 letters to Congress on protecting safety-net domestic nutrition programs. The topic of this year's letter-writing campaign is very straightforward. 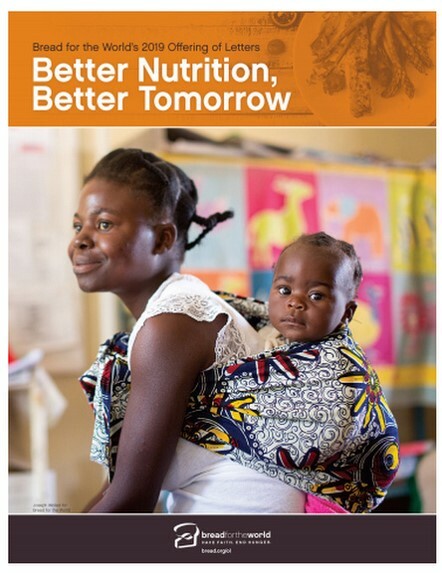 We are asking Congress to pass legislation to establish a new, scaled-up approach to global nutrition. 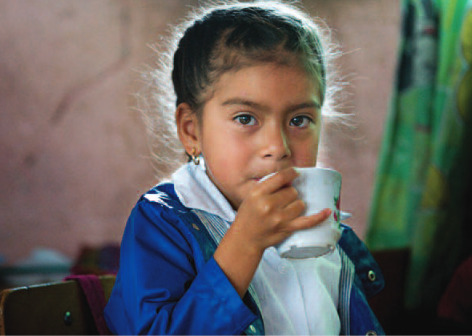 Passage of a bill or resolution will strengthen U.S. commitment to global child nutrition and will lead other countries to join us in the global effort to end hunger. Still, there were some questions. For example, one participant asked whether the legislation Bread supports would target the health of a child before he/she is born. This would mean an emphasis on providing nutrition for expectant mothers. The answer is yes, of course. The 1,000 Days Campaign, which provides a model for global nutrition initiatives, takes into account the health of a child from the beginning of a mother's pregnancy to the boy or girl's second birthday. "Nutrition programs for pregnant women and young children are highly cost effective. Every dollar spent on them produces on average a $16 return from reduced health care costs and people's improved ability to participate in the labor market," says the Hunger and Poverty Facts section of the four-page position paper on this year's Offering of Letters. There were also discussions on whether e-mails are effective, on the timing of letters, and on the mechanics of delivering the actual letters to Congress. We agreed that electronic communications are a relevant way to connect with legislators, but that messages should be personalized and that a postal mailing address should be provided. In Albuquerque, some congregations are planning to continue the tradition of delivering the letters to the local office and perhaps taking the opportunity to discuss global nutrition with a local aide. St. Timothy Lutheran and La Mesa Presbyterian Church have both recently organized visits to the local offices of our elected officials in downtown Albuquerque. Along those lines, we are working on setting up local visits in Albuquerque to the offices of Rep. Debra Haaland, Sen. Martin Heinrich and Sen. Tom Udall, in conjunction with Bread for the World's Lobby Day, which is on June 11. At least two people from Albuquerque are planning to visit Capitol Hill on that day. Several churches and one synagogue (along with a national representative from MAZON: A Jewish Response to Hunger) organized a local Lobby Day in June 2017. One of the two people planning to attend Lobby Day in Washington this year is Kara Bobroff, a new member of Bread for the World's board of directors. The visit to Capitol Hill would coincide with the summer board meeting. I (Carlos Navarro) also plan to attend Lobby Day. Bobroff, founding principal of the Native American Community Academy (NACA) in Albuquerque, was a special guest at our Offering of Letters workshop. 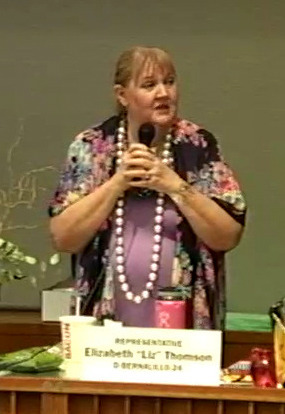 She spoke on strategies to engage Native American communities in our anti-hunger work in New Mexico and elsewhere. "As far as getting more Native American communities involved [in anti-hunger efforts], the focus on children is one of the primary ways to do that," said Bobroff. She pointed out that ensuring that children have adequate nutrition is a universal goal for communities across the globe. In part because of her great success with NACA (which serves as a model for Native communities elsewhere in the country) and her 30-year track record in education, Gov. Michelle Lujan Grisham earlier this year appointed Bobroff as one of the deputy secretaries of New Mexico Public Education Department (PED). "She helped to create a network school scorecard to provide a more holistic view of school and student success in order to guide future educational growth," said a press release from Gov. 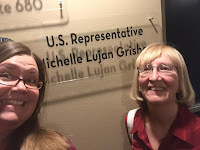 Lujan Grisham's office. 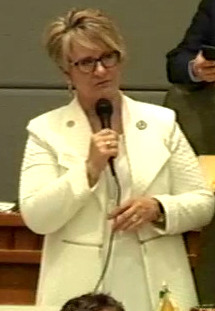 Bobroff spoke enthusiastically about a new initiative in this year's 60-day session of the New Mexico State Legislature that created a new early education agency. The Early Childhood Education Department, which was approved by the State Legislature, would develop programs for infants and young children up to age 4. The programs would include home visits for families, child care assistance and prekindergarten. "I think there might be way to have the efforts of [local Bread advocates] connect with some the programming with women and children at that age level," said Bobroff. So how did Bobroff become acquainted with Bread for the World? She learned about the organization while serving with Bread president David Beckmann on former President Barack Obama's Advisory Council for Faith-Based and Neighborhood Partnerships. Beckmann asked her to consider becoming a member of the Bread board, and she accepted an invitation to be part of the ballot for the board of directors. She became a member of the board, beginning on Jan. 1, 2019. As a new board member, it was very valuable for Bobroff to meet with some grassroots members at our Offering of Letters workshop. "It's interesting to know the work that you're doing locally, but also what's happening at the other levels as well," she told participants at the workshop. Here is a four-minute clip of Bobroff's talk at our local Offering of Letters workshop. (Ivan Westergaard of St. Paul Lutheran Church and Rena Dragoo of Immaculate Conception Catholic Church look on). At Sen. Tom Udall's weekly reception in Washington, D.C.
Larry is running through heaven right now and has fought an heroic fight with cancer. -from Ellen Buelow's Facebook post on March 8, 2019. Larry Buelow was one of the healthiest persons I knew. He tried to eat right and he exercised frequently. His favorite type of activity was running. In fact, he was part of a local running club. Exercise gave us a common theme to discuss. I try to work out as frequently as I can, but I hardly seemed to achieve the same results as Larry, who seemed like a very fit guy. Larry enjoyed the legislative advocacy process, participating several years in Bread for the World's Lobby Day. He was also very willing to share his insights and expertise regarding our roles as citizen advocates. In our 2017, Offering of Letters workshop, he and Ellen were part of a panel of local anti-hunger advocates who spoke about their experiences connecting with elected officials. Very often, our visits to congressional offices were with legislative aides (whom we got to know well). But Larry and Ellen were fond of speaking about their encounter with then Rep. Michelle Lujan Grisham on an airplane coming back to Albuquerque. 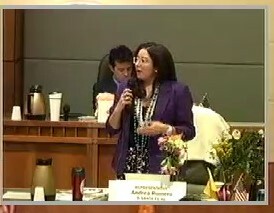 They conversed about the ask of the year's Offering of Letters, which Rep. Lujan Grisham wholeheartedly supported. Larry, a lifelong Republican, was a strong believer that hunger can be best addressed in a bipartisan manner. One of the last times I had a chance to spend a meaningful amount was in March of 2018, when we walked from the Roundhouse to a coffee shop in Santa Fe. Instead of just picking up coffee, we had chance to sit down and chat on a variety of subjects related to hunger and politics and his work with refugees via Catholic Charities. We happened to be in Santa Fe for End Hunger Day, and also to connect with the lead sponsors of House Memorial 90, which proposed the creation of a Hunger Council to address hunger in New Mexico in a comprehensive manner and on a long-term basis. Larry was unable to join us in March 2019, when House Memorial 65 not only reaffirmed the existence of hunger council, but also provided for the creation of a hunger caucus, led by Rep. Joanne Ferrary (a co-sponsor of both HM90 and HM 65). 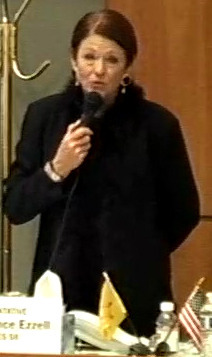 Even though he was unable to join us, Ellen was there in Santa Fe, offering not only her support but that of Larry. That was on the Tuesday before he passed away. Larry will be greatly missed. and our efforts to end hunger in New Mexico, in our country, and around the world are stronger because of his participation. We continue our anti-hunger work with his strong blessing. 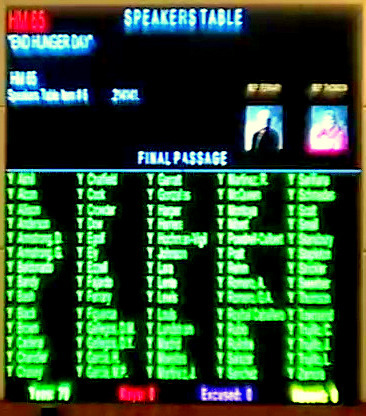 declared Tuesday, March 5, as End Hunger Day in the New Mexico State Legislature, reaffirming our efforts to address hunger (and poverty) in New Mexico in the broadest way possible and to consider long-term solutions to this problem that has afflicted our state for so long. 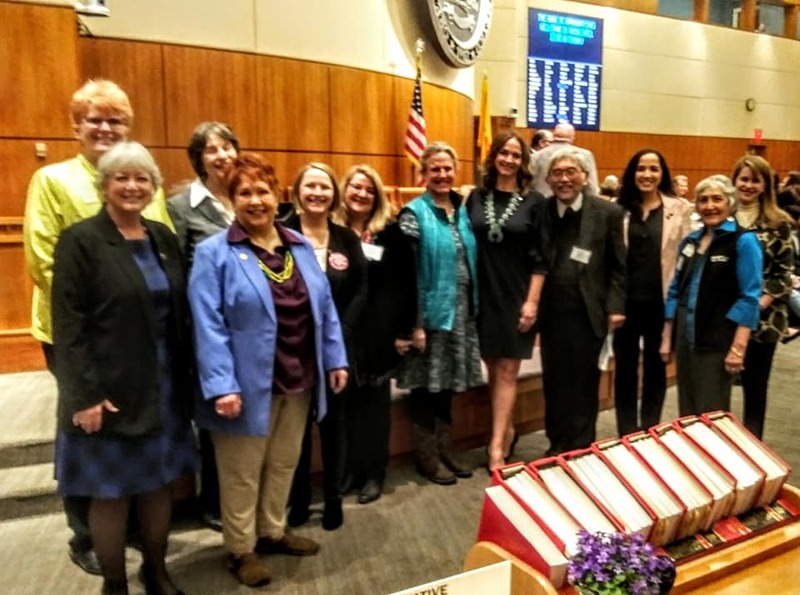 The memorial states that the hunger council that was created during the 2018 legislative sessin (via House Memorial 90) "be requested to continue its work on a single, statewide plan forending hunger in New Mexico." The big difference from last year's HM90 is that this year's memorial also resolves that "members of the New Mexico legislature be requested to form a "hunger caucus" to support legislation aimed at ending hunger in New Mexico." In the coming days, we'll post a list of members of the Senate and House who signed on to the Hunger Caucus. HM65 saw first light this legislative session as House Joint Memorial 13 (HJM 13) to reflect a joint effort with the Senate. With Senate action uncertain, it became a House initiative. Later, we learned that a joint memorial in the Senate (SJM 16). That measure is labeled as "House Table," but also indicates a 34-0 vote. (As it turns out, a version of HM65 was read in the Senate on March 5, thanks to the efforts of Sen. Michael Padilla). 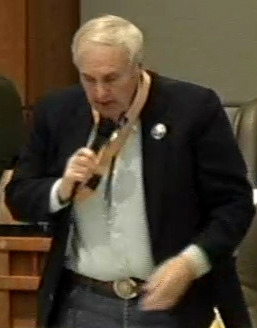 Another change from the initial HJM 13 was the addition of a fifth lead sponsor: Rep, Anthony Allison of San Juan Pueblo, to the four original sponsors, Rep. Joanne Ferrary of Las Cruces, Rep. Rebecca Dow of Truth or Consequences, and Rep. Karen Bash and Rep. Liz Thomson, both of Albuquerque. 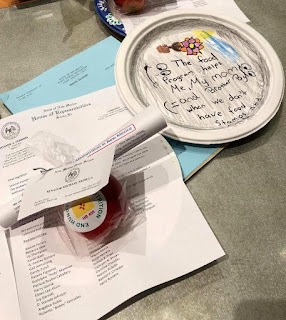 Ahead of the reading of HM65, legislators in both chambers received a nice "package," comprised of a paper plate with a message from a person suffering from hunger, a sheet with instructions for a SNAP Challenge, a request (penned by Rep. Ferrary) to join the bicameral Hunger Caucus, and an apple (courtesy of Allison Griffin of Cullari Communications Global). Cullari Communications is promoting nutrition legislation via HB466). A couple of the lead sponsors of that bill (Rep. Ferrary ane Rep. Bash) are also among the five sponsors of HM65. Legislators from both parties spoke out in favor of HM65, including sponsors Rep. Ferarry (pictured at left), Rep. Dow, Rep. Thomson, Rep. Bash. 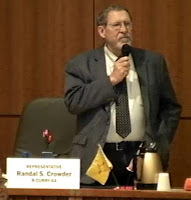 We also heard from Rep. Gail Armstrong (Magdalena), Rep. Andrea Romero (Santa Fe), Rep. Bill Pratt (Albuquerque), Rep. Randal Crowder (Clovis), among others. Many hunger-related concerns were raised, including an endorsement of our proposal to create a statewide and long-term plan to address hunger in New Mexico. Some specifics were mentioned, including the need to provide nutritious food to our children and seniors. Some legislators mentioned a lack of services for seniors, particularly in rural communities. 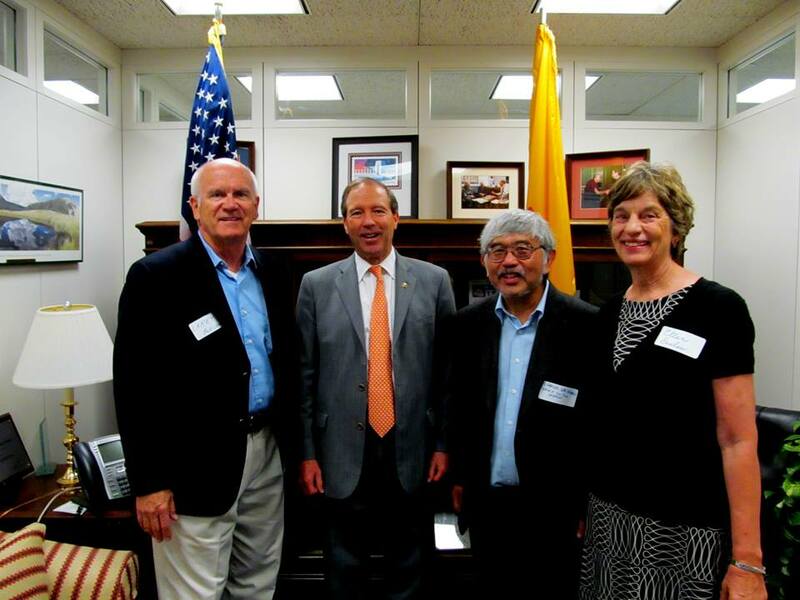 With HM65, we took another step toward the goal of ending hunger in New Mexico. But stay tuned. Our work is still only beginning. LORD GOD, I pray for our Governor, the members of our New Mexico State Legislature, and other elected leaders. May they be moved to make ending hunger in our state a priority. Grant them clear minds and generous hearts to sustain and improve those programs that provide help and opportunity to many people. Amen. After a productive day at the State Legislature, fellow Interfaith Hunger Coalition advocate Joy Dinaro and I were waiting at the Santa Fe Depot Railrunner station to catch the 4:15 p.m. train back to Albuquerque. As we stood on the platform minutes before the train opened its doors to passengers, Joy spotted a woman she knows called Felis, with whom she has served on prison ministry. Felis had traveled to Santa Fe with a friend to celebrate that friend's birthday. As Joy introduced me to Felis, she mentioned my role as volunteer state coordinator for Bread for the World in New Mexico. Felis' eyes lit up, and she proceeded to tell us a wonderful story about how she connected in a small way with our anti-hunger organization. Felis and her companion had visited the nearby Santuario de Guadalupe. 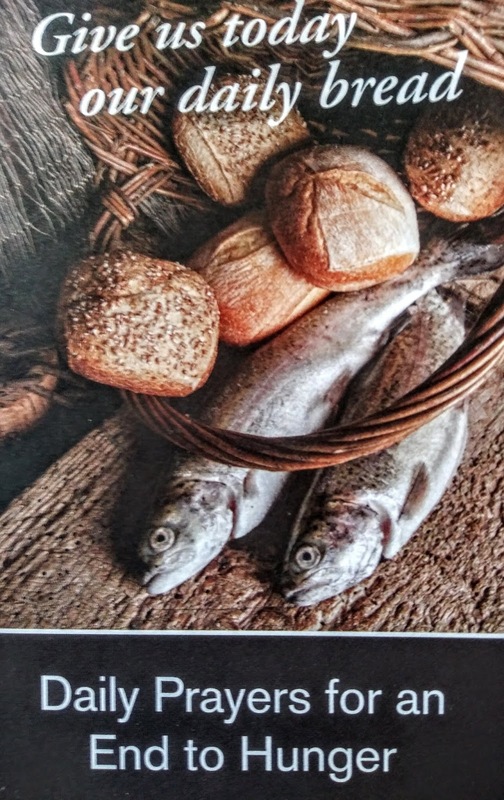 On the resource table, they spotted a single copy of Bread for the World's brochure Daily Prayers for an End to Hunger. 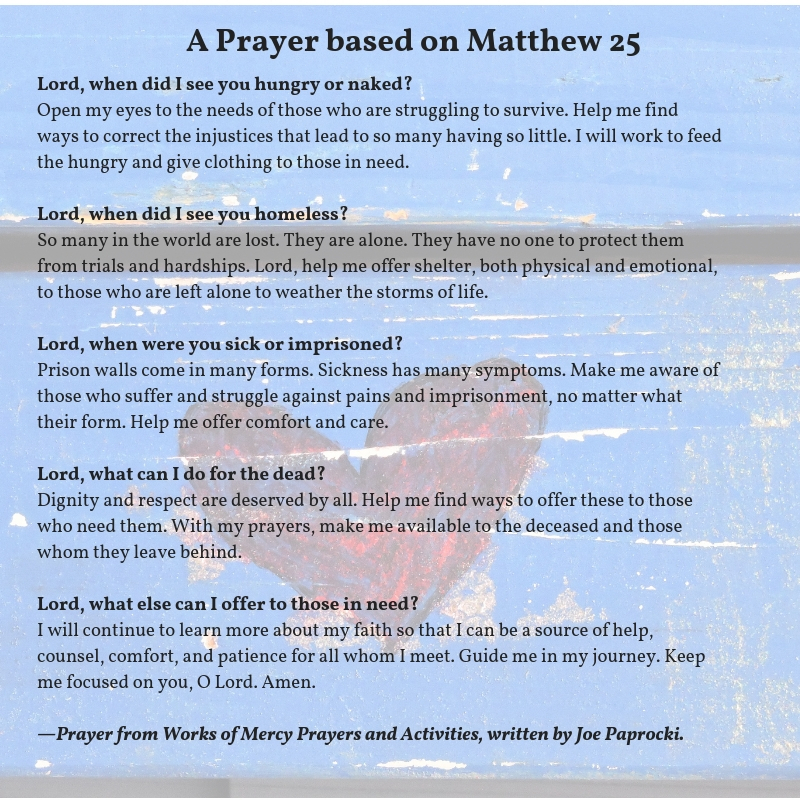 "Even though it was the only one left, I just had to have it," said Felis, who was looking for a prayer resource to use during Lent. And the timing was right for her to find the brochure because the following day was Ash Wednesday. In retrospect, the appearance of a set of prayers on hunger was appropriate for those of us who had just spent time in the State Legislature, where Legislative Memorials were introduced reconfirming the creation of Hunger Council and Hunger Caucus to put a priority on addressing all aspects of hunger and finding long-term and broad solutions to the problem that has affected our state for so long. A few of us were on hand, when the House Memorial was read on the House floor on Tuesday. More on that later. I adapted the prayer for Tuesdays from Prayers to End Hunger in this post as a response to our successful day in Santa Fe, as well as to mark the beginning of Lent (especially in the context of how Felis found that lone brochure at the Santuario de Guadalupe). 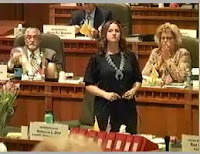 At the beginning of the 2019 session of the New Mexico State House of Representatives, Speaker Brian Egolf promised efficiency,meaning that actual bills would receive priority on the House floor over non-binding memorials. Often these memorials have been used to recognize a group, commemorate an event or express an intention or a goal on a very important issue. According to the State Legislature's Glossary of Terms, a memorial is "a formal expression of legislative desire, usually addressed to another governmental body, in the form of a petition or declaration of intent." Speaker Egolf's directive did not necessarily diminish the importance of each of the topics and groups that were going to be recognized. In lieu of a memorial, these groups, issues and commemoriations would be recognized with a certificate, which is an "expression of...congratulations or acknowledgment of achievement." In other words there would be a written recognition but there would be no ceremony on the House floor. This change of policy was covered in an article published in The Albuquerque Journal on Jan. 15. So, where did this leave the End Hunger in New Mexico memorial for this year? This memorial, put together before the start of the session, was initially sponsored by Rep. Joanne Ferarry. The measure promoted the creation of "a multidisciplinary, multi-stakeholder 'hunger council' made up of legislators, state and local government agency representatives and experts in hunger and poverty policy has been meeting to develop a single statewide plan for ending hunger in New Mexico." We are happy to say that Speaker Egolf agreed that hunger in New Mexico is an important enough issue to bring to the House floor. End Hunger Day in the New Mexico State Legislature is scheduled for Tuesday, March 5, at 11:00 A.M. House Joint Memorial 13 (HJM13) will be read on the House floor and members of the Hunger Council will distribute important materials to each of the legislators. And if the language sounds familiar, House Memorial 90 in the 2018 session, expressed the initial intent to create the hunger council. That memorial was introduced by then Rep. Sarah Maestas Barnes, along with Rep. Ferrary, Rep. Rebecca Dow and Rep. Deborah Armstrong. The Interfaith Hunger Coalition, Roadrunner Food Bank and other anti-hunger organizations are currently involved in the council. HJM13 not only reaffirms the creation of the Hunger Council, but also provides for the creation of a Hunger Caucus within the State Legislature (comprised of both House and Senate members). The council will serve in an advisory and research capacity, while the caucus (to be recruited by Rep. Ferrary) will deal with the actual nuts and bolts of anti-hunger legislation. In addition to Rep. Ferrary, HMJ13 is co-sponsored by Rep. Dow, Rep. Liz Thomson and Rep. Karen Bash. Bread for the World’s 2019 Offering of Letters: Better Nutrition, Better Tomorrow urges our government to accelerate progress toward ending hunger by increasing funding for global child nutrition programs. In this video, Bread President David Beckmann introduces us to the letter-writing campaign for this year. It seems the idea of reimposing a gross receipts tax on groceries comes up every legislative session, and this year is no different. New Mexico Voices for Children and other organizations sounded the alarm about this possibility before the session began, and sure enough the food tax seems to have found its way into tax reform proposals in the State Senate. Santa Fe-based Think New Mexico offers an update and tells us why this regressive tax is a bad idea. Food Tax: Here We Go Again! With over $1 billion in new revenue and polls showing that 87% of New Mexicans oppose the food tax, we were hoping that the legislature wouldn't try to bring back a regressive tax on groceries this session. The New Mexican and Albuquerque Journal newspapers published excellent front page articles this morning detailing the negative impact this regressive tax would have on New Mexico families. Please email your state senator and the governor and urge them to oppose these and any other bills that bring back the regressive food tax! New Mexico's tax system is badly in need of reform. It is undermined by more than 300 loopholes, exemptions, and deductions for a grab bag of interests ranging from fuel for space vehicles to professional boxing matches to sales of recreational vehicles. Yet rather than closing special interest loopholes, these bills go after the food tax exemption, the one exemption that benefits hundreds of thousands of low and middle income New Mexico families and that enjoys wide public support. One of the core purposes of tax reform is to make New Mexico's tax system less idiosyncratic and more like the tax structures of other states. Two-thirds of the states (34) do not impose a sales tax on groceries. This includes our neighbors in Arizona, Colorado, and Texas. A 2017 study by Ernst & Young that was commissioned by the New Mexico legislature found that the food tax would hit low-income New Mexicans three times harder than wealthier residents, since poorer families spend a higher percentage of their incomes on food. The good news is that Governor Michelle Lujan Grisham and Speaker Brian Egolf have both taken strong stands against reimposing the food tax. However, we want to make sure that these bills don't gain any traction in the Senate, where powerful senators are pushing them. Contact your state senator to urge him/her take the food tax off the table once and for all! Linda Swindle, Glenn Rosendale and other volunteers from Casa de las Comunidades Catholic Worker House in Albuquerque make frequent trips to El Paso to bring food, clothing and other items to Annunciation House and other organizations in that border community that support refugees. Here is a note from Linda about a recent trip as well as information on how we can help. Yesterday, Glenn and I made our 9th trip to El Paso. The shelter/motel which has become our main contact was expecting 120 refugees that day, and expected to need space at a Budget Motel next door to accommodate the group. A flustered volunteer showed us all the underwear they had to distribute, folded and stacked on a double bed, clearly inadequate to the onslaught of needs she was facing. For a panoramic view, consider that 500 refugees total were expected that day for all Annunciation House shelters. With exception of Annunciation House, most shelters have no kitchens and rely on local families to supply 3 meals a day (! ), we don’t have room for bulk ingredients such as pancake mix. To arrange contact, text or call Glenn (505-489-8100) who lives in SE Albuquerque and Linda (505-515-6241) who lives in Taylor Ranch. We are so grateful to have your support and prayers! As 6-month volunteer “Sue” said to us, it’s unimaginable to think of these refugees as criminals. Look at them. They are so hopeful, so thankful for anything, so eager to help. Homeless Helpers brings food to individuals staying at the Westside Emergency Housing Center. The facility, operated by the City of Albuquerque, offers a safe and welcoming environment to men, women and families experiencing homelessness in our metro area. The center provides only shelter, so a group called Homeless helpers has created system where volunteers bring food to those staying at the facility. Here is information on how you can help. NOTE: If you choose to make a large crock pot type item, there is NO oven, stove or electrical outlet to warm food at the shelter. Please bring bowls & plastic utensils to serve food. Snacks: The snacks can be any individual pre-wrapped items like cheese sticks, yogurt tubes, granola bars, cheese crackers, nuts, etc.. or of course you can make your own. Dessert: The snacks can be any individual pre-wrapped items like cookies, candy, rice crispy treats...or you can make your own. Drinks: Drinks can be water, juice, lemonade, tea or anything pre-packaged. You can bring a jugs of lemonade, chocolate milk, tea, or juice. (You must bring cups if you bring a large jugs of drinks.) Anything extra you bring will be very much appreciated. Additional Non-Perishable Items: Other non-perishable items can be brought to the shelter to distribute at coordinators discretion. Please inform coordinator prior to night to make sure items can be properly distributed. These items may include. New Socks, underwear. NOTE: These items may not all be distributed, so be prepared to take back any leftover items. Bags: There is no need to put food in individual bags. We lay everything out on tables buffet style. Sandwiches together, snacks together, etc. Extra plastic bags (WalMart type) can be brought to give out as needed. Meeting Point / Meeting Time: Meeting Point: We will meet at 7:00pm at Smiths parking lot (Golf Course & Paseo Del Norte) In of the Starbucks. 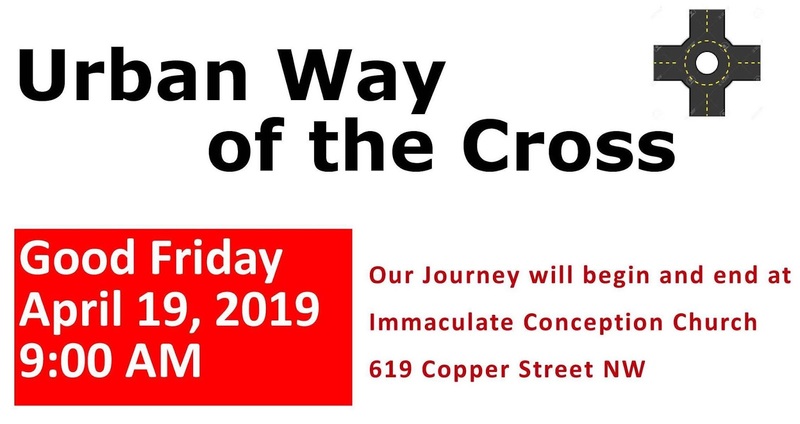 The caravan will leave promptly at 7:10pm. On Location Distribution Time: 7:30pm - 9:00pmish. Volunteers: Quantity - Minimum-4-8/ Optimum-8-12. There are 4 stations of food to distribute, so we need 1-2 people per station to effi-ciently distribute the food. Age: High School age and up. NOTE: High School aged volunteers can receive service hours: shopping, making, transporting and serving the meal. Parents are always welcomed and encouraged to attend. This is not school sponsored. Recruiting/Registration/Sign Up: A Lead Volunteer will recruit 8-12 Volunteer Helpers. Once the Lead has FULL commitments from 8-12 volunteers, Please Sign up at SignUpGenius (link below) for your Homeless Helper Volunteer Weekend. NOTE: You must get a FULL commitment from ALL 8-12 volunteers before you register for your weekend. You will be the only group as-signed to that weekend, cancellations are not an option.